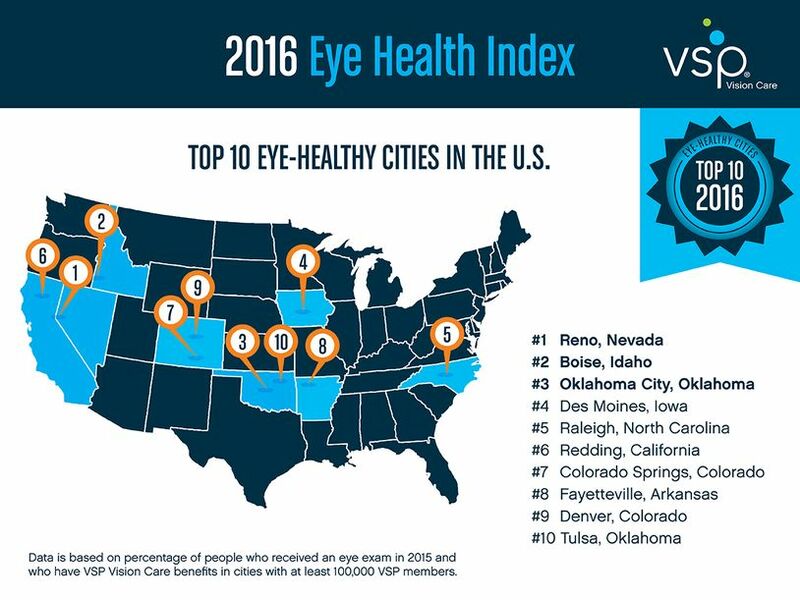 RANCHO CORDOVA, Calif., August 23, 2016—Today, VSP® Vision Care, the largest not-for-profit vision benefits provider in the United States with 77 million members, released its Eye Health Index, featuring the top 10 eye-healthy cities in the United States. 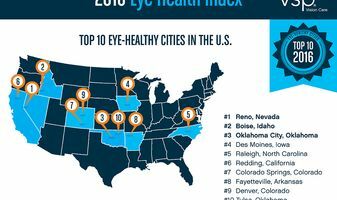 Reno, Nevada, tops the 2016 Index as the nation’s most eye-healthy city. New this year, VSP also unveiled the 10 U.S. cities where the importance of an annual eye exam is not always top of mind. According to the research, Cleveland, Ohio, ranked as the nation’s least eye-healthy city. The Eye Health Index, now in its fourth year, reviews tens of millions of VSP claims from more than 100 U.S. metropolitan areas to identify which cities are the most focused on maintaining their eye health by getting annual eye exams. 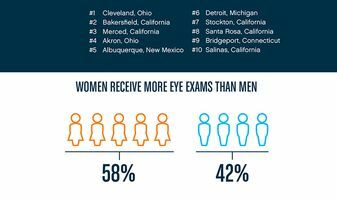 The 2016 index rankings were determined by looking at the percentage of VSP members who received an eye exam in 2015 in cities with at least 100,000 VSP members. VSP provides vision benefits to 1 in 5 Americans. Youth eye health trending up in least eye-healthy cities. While Bakersfield, Merced, Stockton, Albuquerque and Salinas are some of the least eye-healthy overall, they rank among the cities where the highest percentage of residents under 17 are receiving eye exams. Gender eye health gap. In general, women are more diligent about their eye health than men. In all of the cities surveyed, more women visited their eye doctors annually than men. 58 percent of eye exams were received by women compared to 42 percent men.